As smart menswear and classic style continues to enjoy a renaissance in popular culture and fashion, it’s not too surprising that some timeless staples, previously discarded somewhat callously as “old-fashioned” or “stuffy”, are now being trotted out once again and found to be anything but. One such item is the double-breasted cut for suit jackets, sports coats, and blazers. What is a double-breasted jacket? Well it’s quite simple really, the regular suit jacket everyone is familiar with, which fastens with typically two or three buttons at the centre of the front, is known as a single-breasted jacket. A double-breasted jacket wraps further around the chest to fasten slightly off-centre and features many more buttons on the front in an attractive layout. There are other unique features of the double-breasted jacket that make it distinct, including the traditional cut and arrangement of the lapels. 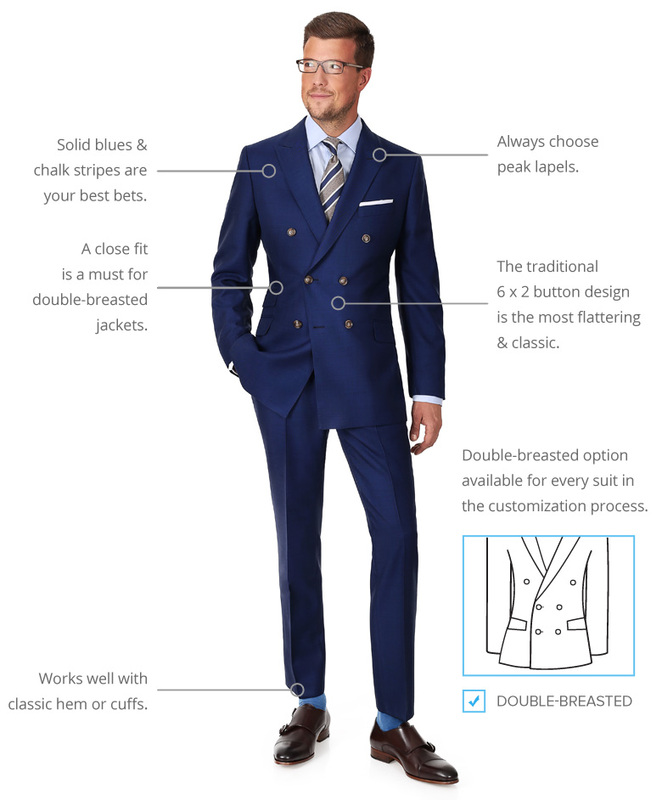 A double-breasted jacket is available as an option for all Oliver Wicks custom-made suits and fabrics (even Tuxedos, aka the Dinner Jacket or Dinner Suit), and you’re free to edit the features of your order as you wish, however, there are certain traditional style elements which work particularly well with the double-breasted jacket. Blue, navy, and grey colours usually look splendid for a double-breasted jacket, and it also works particularly well with pinstripe or chalkstripe cloth patterns. A suit with a double-breasted jacket works equally well with either cuffed or uncuffed trousers, though cuffed is considered somewhat less formal (having its traditions in country attire). 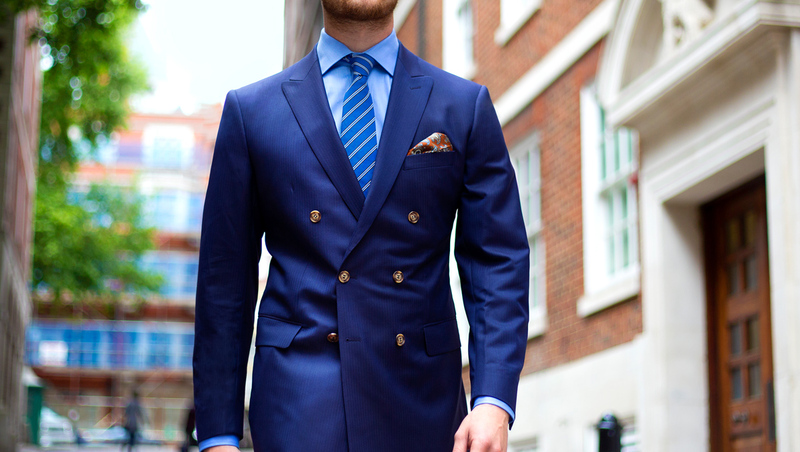 An item many consider a gentleman’s wardrobe essential is the double-breasted navy blazer, with its roots in the traditions of the British Royal Navy, this style is equally at home being dressed up or dressed down. Traditionally the double-breasted jacket will feature peak lapels, flap pockets, and what’s known as a 6x2 (six by two) button configuration. This latter feature is where there are two columns of three buttons (six in total) on the front of the jacket - the three on the right-hand side (if facing the wearer, as per our diagram) are non-functional, while on the left-hand side the top button is also non-functional. The remaining two are functional, though it is traditional to only button the middle left-hand button and leave the bottom button un-buttoned. Some rather rakish gentlemen enjoy the relaxed informality of patch pockets, particularly with less formal fabrics such as winter tweeds and summer linens; patch pockets and peak lapels aren’t typical bedfellows normally, but as the peak is such a core part of the double-breasted look it gets a pass pairing up with the more casual patched pocket. However, if you’re planning on wearing a double-breasted suit to board meetings then casual fabrics and features probably aren’t such a good idea! 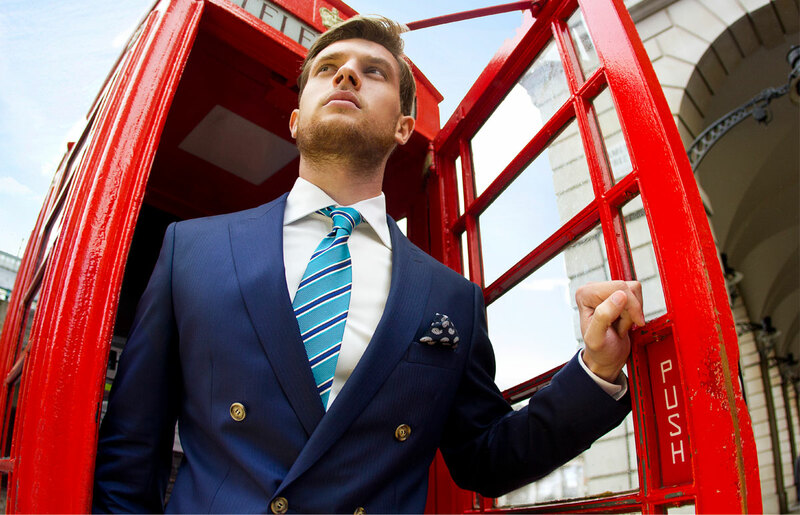 One of the key things about men’s tailoring is that tailored suits and jackets are designed to compliment and accentuate the masculine physique, and that being the case there are sometimes somewhat uncomfortable yet unavoidable truths; double-breasted jackets highlight one such issue - that they look better on slimmer or more athletic men, and can be unflattering for those of a larger build. Double-breasted jackets tend to require quite a close-fitting cut in order to look their best. At the end of the day though, many larger fellows can pull off the look quite well, and confidence plays as big a part as anything else. The double-breasted suit is something of a statement piece that demands attention - it’s not recommended for the faint of heart or shy, retiring types! However, when worn with confidence it does lend the wearer a certain gravitas. Gentlemen well-established in their field might consider a double-breasted suit, but if you’re just starting out, an intern, or attending a job interview, a single-breasted suit is a safer bet. The double-breasted suit is NOT about humility and balance. There’s a reason why it’s associated with big bankers and businessmen! It’s about power and luxury.